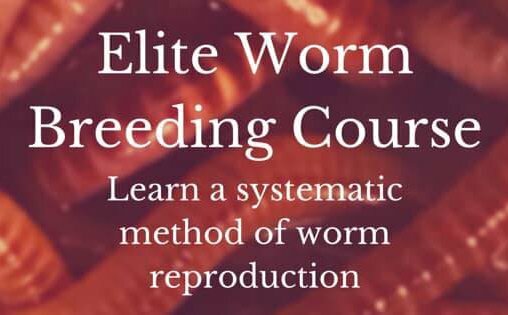 Is there a proper way to dry worm castings? I have 2 worm bins and get lots of worm tea and castings, but the castings are very heavy, like gooey thick mud. I try to dry them a bit but they end up completely drying out into hard chunks that don't mix well with soil. The worms are fed mostly kitchen scraps and newspaper. suggestions? Comments for worm castings too rich? Thanks for posting your question here. I personally do not dry my worm castings out at all due to the fact that it loses a lot of its microbial life and the fresher it is, the more it will benefit your plants. So I do not have much experience in this. However if this is what you want to do for storage or shipping then drying them out is preferred. Be careful not to dry the cast out too much or you will completely kill the microbes in the cast. You mentioned in your email that you always have plenty of castings and tea. This puzzled me when you mentioned the "tea". If I am understanding you correctly, you might be confusing the tea for leachate. I explain a little about the differences between the two here. This could be why your cast is more muddy looking and feeling. The liquid drain off from vermicompost is called leachate and could contain harmful pathogens and microbes you don't want to feed your plants. However if you feed it a lot of castings this might offset the bad microbe community, but nevertheless it's always a gamble. There should never be any liquid drain off in a home vermicomposting system. It should always remain just moist to allow the air to move in and out of the bedding. This will allow your worms to receive plenty of oxygen and keep your food from turning sour. It will also allow your cast to be lighter and fluffier so you won't have that heavy, muddy, and wet feel to your castings. I believe this is the answer to your question about having a bedding too rich in food and possibly added water. Remember that most of the time you should have plenty of moisture in just the food you add to the bedding. You could cut back on juicy fruits. If the bedding seems to be drying out then keep a spray bottle on hand to quickly add moisture. Keep in mind the damp sponge theory. I read your notes. I live in FL, so when it rains here, the bins can get very wet. I drain it out first chance I get, and water plants if they aren't already soaked. Also, when there is no rain, I sometimes add clean (no chemicals) water to the bins, let it drain through and water my plants with it. Based on your notes, it seems I am getting the good and the bad in that water. But my plants generally are very healthy. But the bins/cast are too wet. So, no more adding water? If I make tea the other way (separating the cast and soaking it), my worms aren't that smart to get out before it is too late! I leave the lid open (too long and it completely dries out in the heat), hoping they will move down, but they just clump in the middle. I don't want to drown the little guys. Unfortunately this is the nature of the castings when they remain wet and they generally take a long time to dry out because the cast is very absorptive. When making worm tea (If you are using a 5 gallon bucket to brew your tea) Just get a couple of handfulls of cast and suspend it in a paint strainer as mentioned in the tea section. Don't worry about getting a few worms/cocoons in it. They WILL survive the duration of the brewing due to the oxygen being pumped into the water. When brewing the tea be sure to use castings and not the vermicompost. You don't want the bad microbes. Leave your bin out of the rain and in the shade and cover the bin with a lid or newspaper. Anything to keep the moisture in and the heat out. Your comments are very helpful, I'll try to better protect bins from rain and sprinklers. Just one more thing: if we're not supposed to use the liquid that drains to the bottom of the worm bin, why are worm bins made with spigots? Companies providing these bins specifically say to use it on plants, so you can see how people are getting confused. The first year I got into worm farming I made a spigot at the bottom of my bins. I figured it would be easy to drain the excess liquid. However I never needed to use it as I always watched the moisture level. I do believe this is a good thing to have for beginners who don't know yet how to control the moisture in their bins. Everyone has their own opinions about the leachate and how it benefits their plants. Some plants do well and others do not like the leachate. It also depends on how well the castings are composted. If castings are not refined very well it leaves the bad microbes in that still have yet to be swallowed up by the worms. Again though, this is a gamble that I have lost on before. Don't ever let anyone convince you that leachate is "worm tea". Even the "professional companies". They are wrong and many vermicomposters and regular composters recognize this as the industry standard. Albeit, it makes for a great sell. Do your research and you will find that most professional vermicomposters call the liquid that drains to the bottom of the bin "leachate". Remember, tea is always steeped and never seeped. @Susan... There is nothing wrong with using leachate on your plants. It contains the sane nutrients as the castings. It's not worm tea though. Worm tea is brewed in special brewers that aerate the leachate producing lots of microbes. Tea is a very potent fertilizer that needs to be used within 24 hours of brewing because as the oxygen levels drop, so do the microbes. I see in the comments above that the worm castings need to be kept wet. How do I keep harvested worm castings wet and at the same time keep bad bacteria from growing? I guess my worm castings that have been sitting out in the phoenix summer are completely TOAST!?!?! Live and learn! thank you. The Worm Farming Revolution book covers how to store worm castings. I'll tell you how I do it indoors. I use a plastic tote with holes drilled in at the top. This allows for oxygen to move freely throughout. It's actually one of my old worm bins. Harvest the castings along with some worms. Place the castings along with the worms in the tote or container of your choice. Just make sure it is dark and holds moisture. The purpose of the worms is to continue to refine the castings, keep it aerated, and moist throughout. It ensures everything remains beneficial. Keep the lid on at all times. Have a spritz bottle nearby and keep the castings moist but not wet. Maintain proper temperature by placing the bin out of sun or in a comfortable place. If it feels good to you then the worms and microbes will like it too. This will last more than a year. However fresh castings is the best, but this will keep it as fresh as possible. You can also stir it once in a while. Every two months or so but worms really do help a lot. There are still plenty of food in the castings for the small amount of worms you'll have in the container. Keep adding to the harvest bin until half full then start another. All good information, but I don't think anyone really answered Susan's question which is the same question I have. When I harvest, the castings are gluey, almost like a thick paste. Is there a way to dry them without them clumping into hard rock like nuggets, and is drying, bad? I've used year old castings and they seem as good as new castings. On the gooeyness, I spray the bedding but that is just to keep the bedding moist, and I have gotten to an environment where I don't get much leakage from the bottom of the bin, but when I harvest, the castings are still gooey. Maybe I should starve the worms for a longer period prior to harvesting, so the wet food scraps are gone longer prior to harvesting? Any thoughts? I have the same problem as Ken - gooey ness - making it so hard to use this valuable worm farm stuff. How can it be used on the garden without mixing it with soil -which is almost impossible to do? or watering it down and using the watering can. I have had this problem for about twenty years. Go buy vermiculite and perlite and coco peet. Mix that in a ratio of 1:1, grab the goo and smash it in bit by bit. That ends up being perfect for my plants.